How to switch off the registration form? With the New Registration Form released in Dec 2016, you can do more design than before to fit your event and organisation. 1. Go to "Details" under Event. 2. Scroll to the bottom for "Event Page Theme Color". There are 5 default theme colors available to use. 3. 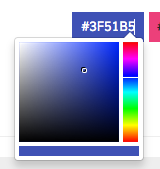 Or you can set your own colors in the color picker or simply type in a color code. The font color shown in the color pickers also represent the actual font color on the form. 4. Click "Save" to save all your changes.